The idea of the Motorfest Friday run prior to the Bay to Birdwood this year, was as a commemorative run of the original one and only run of the first Veteran Car Club of SA, the ‘Old Crock’s Run’ in 1934. Your committee then suggested that we run the same event on the same day as the Bay to Birdwood and make it an annual event in commemoration of the ‘Old Crock’s Run’. After deliberation, whether we start this year or next, there was no objection to the concept of the run starting this year. Discussion did occur around the fact that it could be seen as opposition, but not intended, to the Bay to Birdwood event. After further discussion, it was pointed out that there were a number of our members who preferred not to enter the Bay to Birdwood event for various reasons based on their own historical facts. It was noted that various other motor vehicle clubs also met at selected positions along the Bay to Birdwood route, as well as some individual motor vehicle club members who make their own decisions to attend solo somewhere along the route to see the cars go by. The form of our new inaugural commemorative run was to leave the Parade Ground alongside the Torrens River in the City. We were to pull up at a nominated position on our route, and see the Bay to Birdwood entrants passing by. The lateness of our start from the Parade Ground was due to the late arrival of some vehicles because of the strong northerly wind that morning, we were unable to get to the nominated position prior to the first vehicles passing. But, we were able to greet the veteran vehicle entrants en route at the Anzac Highway/Greenhill Road intersection and give them frantic waves. Our nominated observation position for the morning was at the Morphettville Racecourse Car Park, where we enjoyed the passing parade and enjoyed our morning tea. The upshot of the whole event was that next year, we could still leave at 8.30am from the Parade Ground (luxury timing! ), but pull up earlier on Greenhill Road and wait for all the entrants to go by, and then we could move on and complete our run to Glenelg Oval, the original finishing point for the 1934 event. We will also not make a catered lunch a compulsory part of the event, but include it as optional on arrival at Glenelg Oval. This will then allow Club members to proceed to other pursuits after the normal convivial post run discussions. On the Bay to Birdwood run, the veteran vehicles were able to leave early and this enabled them to get to Birdwood at a reasonable time. Just under one thousand vehicles is still a considerable amount of motor vehicles, and probably contributed to the event running a lot smoother this year. By the way, if our cars were ‘Old Crocks’ in 1934, should we be calling it ‘the really, really old crocks run’ now that most of our vehicles are 100 years old!! The ‘Down Under’ London to Brighton Run was held last weekend, and the threatening weather cleared away by start time and for the rest of the day. It is the event where the most veteran motor vehicles turn up for a day run, in South Australia. The numbers appeared down this year, but it was still a great day for veteran motoring. The numbers suggest that out of the 34 entries, 20 entrants nominated our club as their club representation and seven club members nominated one of their other club affiliations for the event. A great turn out ladies and gentlemen!! Club member and Committee member Andrew Hayes led the event with his 1902-1905 Holsman High Wheeler Motor Buggy as the Pilot vehicle for the event. As all high wheeler drivers know, these vehicle types were fitted with a towing point just in case their engine failed. A borrowed horse could then be hitched onto the vehicle to get the forlorn driver home. Our thanks go to The Vintage Sports Car Club of SA for running this event, providing terrific marshalling, and perfect weather for veteran motoring. The Association of Veteran Car Clubs of Australia announced last week that Andrew and Frances McDougall from Victoria have been awarded the Lord Montagu Trophy for this year. Our congratulations go to Andrew (Club member) and Frances for this recognition of their outstanding service to veteran motoring in Australia. The club also congratulates club member Jon Pyle and his wife Di, for the recognition by the veteran vehicle membership in Australia, who were also nominated for this award. Marshal Training. Some of you may have noticed that the All British Day Committee have issued an invitation to Clubs and individuals to attend a Police Marshal training course on 30th January 2015. The course runs for about an hour starting at 7.30pm at Croydon. Apparently once you have attended this training you are recognised as a Marshal for life. For those members interested in attending this important course, please contact me by phone or text on 0417 819 080, phone 8277 2468 or email p.keane@purkinje.com.au by 16th November so we can make a group booking. Membership. There are a few members who have not renewed their subscriptions for the current year. We will be sending out reminders in the next few days to ask whether you will be renewing your membership, or, requesting whether you could advise us that you do not wish to continue with your membership of the VCCSA. 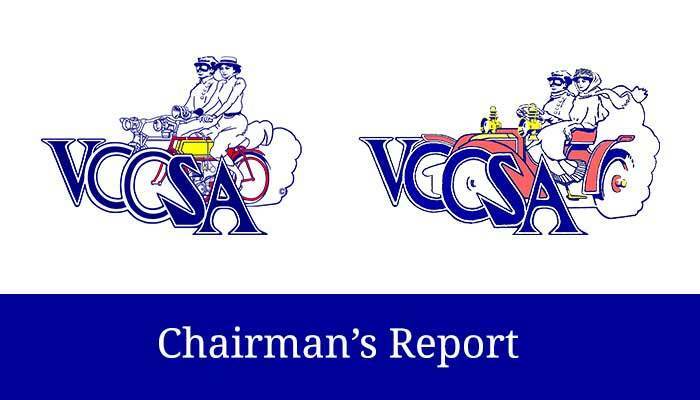 For those that rely on their membership for the registration of their vehicle on Historic Registration through the VCCSA, you must remain a financial member of the Club. You are reminded that non payment of your fees renders your vehicle unregistered to be used on SA roads. As a club we are bound to officially notify the DPTI Car Registration Department if your subs are not paid.